Yes, I realize my blog needs a new name. What I'd really like is a whole new blog. I'm a little tired of this circa-2002 Blogspot template with a sidebar I haven't updated in two years that still says I live in Juneau. Plus, this blog is now at 96 percent storage capacity, so realistically it only has a few more weeks in which it will even allow new content. But building a new blog from scratch, hopefully one that also holds the archives of my old blog, takes time and knowledge that I don't exactly have right now. In the meantime, I don't want to stop journaling just because I can't make a smooth transition. I will probably continue to publish posts under this header for a while longer. It's been a good run for "Up in Alaska." I started this blog on Nov. 3, 2005, for the same reason most people start blogs - to keep my faraway friends and family updated on my new life in Alaska. Since then, it's hosted 1,182 posts, who knows how many photos, 992 "followers" and more than 2 million visitors. And it completely changed my life. While the blog didn't spark my interest in cycling and desire to enter the 2006 Susitna 100, it certainly helped me focus my efforts and sustain my motivation, which led to new passion, which led to many future cycling adventures. It reignited my love of writing and generated new interest in photography. And I'm pretty sure this blog has more clout in the eyes of my new employers than my bachelor's degree in journalism. Plus, I have this great record of the past five years of my life. As to the new blog and new chapter, there is much yet to be determined. I feel like I'm entering a quieter period of my life, and I'm perfectly at peace with that. I've had a lot of time to reflect on what I left behind in Alaska, and I've realized that there was strikingly little that I couldn't take with me. Montana alone holds more beauty and possibility than I could possibly consume with my meager lifetime, and I'm certain that many new and intriguing adventures await for as long as I decide to stay. 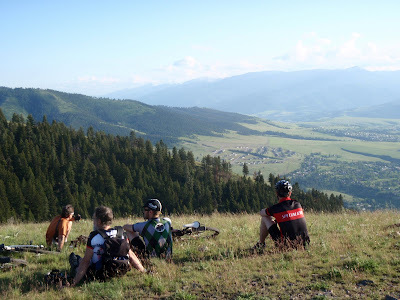 As for Missoula, it appears the geography was custom-built for mountain biking, and the craggy peaks of the kind of mountains I lust for are not far away. My new job is exciting; I still can't believe that actually landed in a career centered on bicycle travel. I am sad about the end of "Up in Alaska" and all it implies. But if you had told me on Nov. 3, 2005, what my blog would hold in the next five years, I would have scarcely believed most of it. I can only hope the next five years hold just as much surprise. Good luck with your cool new job and home. I've really enjoyed reading your blog the past 5 years and look forward to your new blog! Tom's suggested new title: Jill's Big Ride. That's what your life is, you know. As for creating new blog while maintaining links or archive of old, talk to the Fatty Family. I think they've both done it before. Wail on Montana...it's your brand new oyster. I want the blog in whatever name to continue. Jill, thanks for everything so far! You're my hero. Looking forward to reading about your new adventures. good luck in your new life, and look forward to whatever comes next, thanks! Jill, you can't not blog your new adventure - it would be horrible not to be able to follow all you do. You can figure out how to set up a new blog and keep the "old" links, etc. Best of luck in your new life and I know you will be a success. Sounds to me like you have landed the perfect job. Keep in touch. We will be following every step of the way. Blogs have a storage limit? Good luck with you new career adventure. Perhaps I'll see you when I bike through on my way to somewhere. Jill, I've loved reading Up In Alaska, and I look forward to reading whatever you develop to reflect your chapter of life in Montana. I wish you the best of luck at your new job and in your new adventures! I'm still in! Welcome back to the lower 48. Doesn't matter what you call it, I still love your blog! 1) The storage capacity is probably talking about all of your pictures. You can pay to expand your picture storage, or you can start hosting them on other free places (like flickr). There's no limit on the number of posts you can have. 2) You can update your template without losing any of your content, by just going to the "design" or "layout" tab. Blogger in Draft also has an option to create a somewhat unique template by going through a series of steps and choices, or if you want to get fancy you can add coding with the "html" option. 3)You can change the name and even internet address of this current blog by going to "settings" and then "publishing"
4) If you choose to totally move to somewhere else, you can download an archive of your blog to your computer by clicking "Settings" "Basic" "Export blog" "Download Blog"
I think you should consider 'Up in Alaska' the foundation for the life you are living now. Not really the end, more like a beginning on which to build. I love reading your blog. I am what I guess you could say is a 'housecat' by nature. I 'know' Alaska through your eyes. Although I have visited Montana before, I'm certain you will show me a completely different side of it. I like the name in the address of the blog - Arctic Glass. As another pointed out, it's valid to keep it since it reflects the origins of your blogging. "Montana alone holds more beauty and possibility than I could possibly consume with my meager lifetime,"
That is so up beat and a keeper, I will insert _______ in place of "Montana"
Your blog has not only inspired my cycling the past five years, but I get more hits on my blog coming from your link than any other place. I get at least 30 hits a day coming from blog. The only other link that comes close is a link from Kent's blog. Thanks for all the sharing. It's been quite a ride. Jill, I'm proud to be one of your 992 followers and I look so forward to your adventures to come. It's great to see an outdoor-related blog with so many folowers - you give the rest of us outdoor bloggers something to aspire to. If you decide to shift over to a self-hosted wordpress blog please do a post letting us know how you did it - I've been planning to do this myself for ages but can't face the hassle! Jill, I found your blog in 2006 and have followed it ever since. I've wanted to come to Alaska since I was 15. Now I'm 25 and have been in Juneau since May living out my dream. Over the past several years of reading your blog I graduated college, worked two years in aviation, got laid off, interned for a congressman and dreamed of moving here. Your blog of daily adventures on life here helped me keep my eyes ony dream. Right now I'm on a backcountry trail crew and hope to find a more permenant job come fall when this ends. It's funny how the first few weeks ixarrived here were your last weeks in Alaska. I love the way time makes things happen. If anyone had told me back in 2006 as I gawked over your photos that in four years I'd be looking at those sights with my own two eyes I might have laughed. I am looking forward to seeing what your life in Montana brings. I hope you keep blogging away! Bravo and thanks. Best of luck with your new job and keep your desire and passion. Heck, yeah! The blogging thing has brought me nothing but good people and good times. It's been an amazing ride. Guaranteed you will have more of the same! Jill, thaks for all of your inspiration! and please, please, please get involved with mountain bike advocacy in some way. we need your voice! i think you'll find many ways to help. i think there is a lot of happenings going on in montana right now. i know you could make a big difference! Looking forward to the next five years of your blog! Jill, please leave this blog online when you switch to your new one. There's a lot of good info people may still want to read. Enjoy Montana, and as Frank Zappa would sing "be a dental floss tycoon." Good luck on the new chapter. I've been reading your blog since I arrived in AK (also in 2005). 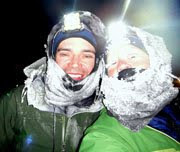 You've added a rich context to my life and I even saw you take off from the start at your first Iditarod ride, to boot! (I've got a few pics.) That was fun! As for where we live...it's not where we live, but who we are that makes the difference. As an adventurer, you will always be fascinated with life and you will purse with heart. Good for you!